Sing! Move! Act! Compose! Play! The After School Opera Program is offered to children ages 7 to 12 at five locations across the city. Under the guidance of the lead artist, a program assistant, and special guests, children explore opera through singing, composing, and drama. This fun and unique program develops children’s performance and music skills while nurturing their self-confidence. Friends and family are invited to attend a celebratory performance on the final day. 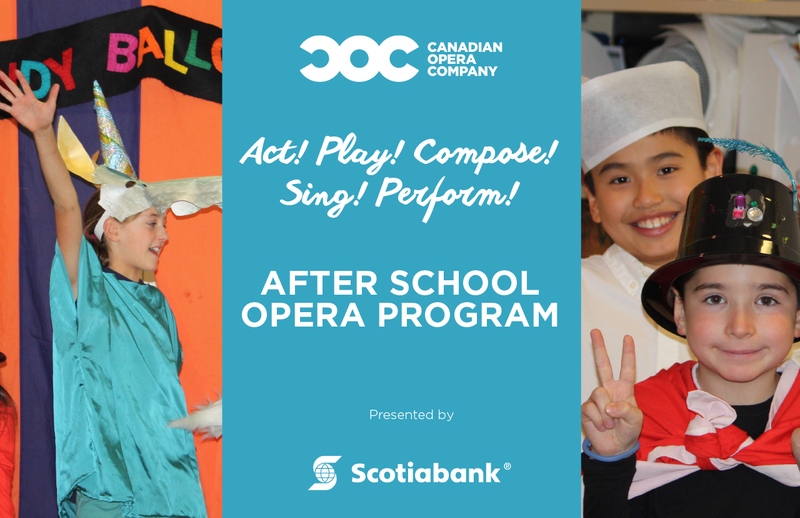 Each term of the After School Opera Program runs for approximately 10 weeks. Registration costs vary by location, starting as low as $11 to a maximum of $15 for the entire program. See locations below for details. All classes take place on Mondays from 4–6 p.m. in the community room at Montgomery's Inn located at 4709 Dundas St. W. (at Islington). More information about our ASOP contact Montgomery's Inn! All classes take place on Tuesdays from 4–6 p.m. in the Barbara Frum Recreation Centre, located on the lower level of the Barbara Frum Library, 20 Covington Rd. (Bathurst and Lawrence). More information about our ASOP contact Barbara Frum! All classes take place on Wednesdays from 4–6 p.m. in the Community Hall of West Neighbourhood House (formerly St. Christopher House), 248 Ossington Ave. (at Dundas Street West). More information about our ASOP contact West Neighbourhood House! All classes take place on Wednesdays from 4–6 p.m. in the multi-purpose room located at Parkway Forest Community Centre, 55 Forest Manor Rd. (Don Mills Rd. and Sheppard Ave. E). More information about our ASOP contact Parkway Forest! All classes take place on Thursdays from 4–6 p.m. in the dance studio at St. Lawrence Community Recreation Centre, 230 The Esplanade (Front and Sherbourne). More information about our ASOP contact St. Lawrence CRC! is a composer of concert music, film score and opera. His music has been described as "complex and clear, with subtle playfulness," and has received a number of awards including the Karen Kieser Prize in Canadian Music, multiple SOCAN Awards for Young Audio Visual Composers, and the Toronto Emerging Composers Award Honourable Mention. He is the founder of the Toy Piano Composers collective, and he has been commissioned by Ensemble Paramirabo, Musica Reflecta, ArrayEnsemble, the Bicycle Opera Project, Thin Edge, and Tapestry Opera. The films he has scored have screened internationally, including at the Cannes Festival, Toronto International Film Festival and Clermont-Ferrand. Chris has a knack for getting young people excited about music. Recent projects include a mini-concerto for a young musician and professional string quartet, as well as a city-wide student composition collaboration with Doug Friesen, Continuum Ensemble, and the Toronto District School Board. He is composing an opera for Tapestry Opera with librettist Julie Tepperman that tackles the world of bullying. Chris has a decade of experience working as a music director in summer camps, including founding the music program at International Summer Camp Montana in Switzerland and acting as composer at the COC’s 2015 and 2016 Summer Opera Camps. Chris is the lead artist at the Etobicoke, North Toronto, Downtown West, and Downtown East locations of the After School Opera Program. enjoys a diverse career as a musician, composer, sound designer, music director and artist educator. She began her musical training as a classical pianist and her love of creative collaboration led to work in dance, theatre and film. Over the past 30 years she has created scores for over 90 productions for regional and independent theatre companies across Canada: her work has been heard on international stages with Ronnie Burkett Theatre of Marionettes, Manitoba Theatre For Young People and DynamO Théâtre. Cathy was assistant conductor/keyboardist for the Toronto company of Jersey Boys. Recent projects include The Intergenerational iPad Vocal Group, the score for the documentary film The Motherload for CBC’s Doc Zone, Valley Song for Gateway Theatre and Fornes X 2 for Theatre Asylum. In addition to her work with the After School Opera Program, Cathy is an enthusiastic artist educator for the Royal Conservatory of Music, Tapestry Opera, the Classical Music Conservatory, Jumblies Theatre, and Community Arts Guild. Cathy is the lead artist at the North York location of the After School Opera Program. Participants prepare for their final performance, putting into practice what they learned earlier in the term in an artist-educator-led workshop on theatrical makeup. Ready to howl at the moon! Werewolves, zombies, vampires and ghosts get into costume and character as they get ready to perform in the world premiere of mini-opera The Otherwordly. What Are People Saying About The After School Opera Program? Established program centres include: West Neighbourhood House Music School, Barbara Frum Recreation Centre, Montgomery's Inn, St. Lawrence Community Recreation Centre, Parkway Forest Community Centre. PDF document includes policy pertaining to educational programs for children, youth and school bookings.